Sweden "Berwald Oxenstierna, Su-san, Svi"
A neutral country and ex-Viking that was once nicknamed “The Conqueror of the Baltic Sea” and “The Lion of Northern Europe.” In the first episode of the anime adaptation, he made a brief cameo appearance in which he was shown with light brown hair and dark brown eyes. 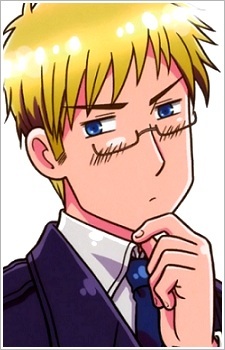 When he made his official debut in Hetalia World Series, his hair was changed to being blonde and his eyes were changed to blue. Back when they were under the rule of Denmark, Sweden and Finland ran away and began living together. Finland was later overpowered by Russia and was under his control; he claimed to be “freer” when living in Russia’s house, but didn’t have as much fun as he did with Sweden. Sweden’s adopted son is Sealand, whom he bought from an online auction. He also has partial custody of Latvia and Estonia, which came to be after he and Finland ran away from Denmark. He doesn’t talk much and seems very mysterious and scary due to his intimidating appearance. It was said that he came to be that way because he was born in a cold place. However, he’s rather serious, honest, playful, and kind underneath all this. Surprisingly, his hobbies include debating, making furniture, art, glass crafts, making a huge amount of Surströmming (which was said to be able to be used as a lethal weapon), and putting most of his effort into the welfare of his citizens. It is also to note that he speaks in a Tohoku dialect.